Chanced upon this cosy cafe at Robinson Quay when our initial meeting place at Kith Cafe was closed for the day. 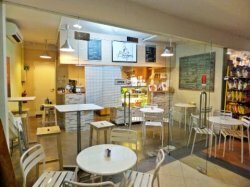 The cafe is opened by a friendly couple, whom they not only serve the customers and also do the cooking by themselves. Our host ordered some mains on the menu, so that we can try on several dishes. 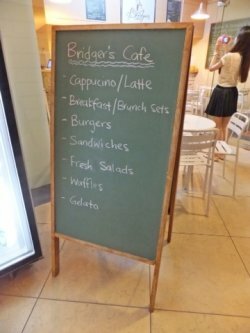 Cafe's service was prompt, though the waiting time for the meal was slightly longer due to they freshly cooked when ordered. The most delicious one was the Smoked Salmon Carpaccio Salad which cost $12.50. The smoked salmon had a mild smoky aroma, not too overly smoked like the ones we got at local supermarket. 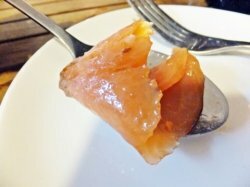 The salmon meat was light in salt and soft to chew on. 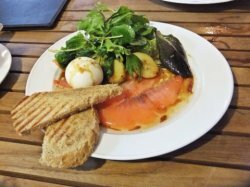 The egg was poached, yellowish yolk flowing out when cut opened. But the egg white was slightly firmer. The star was the green salad. The salad sauce of red wine and sesame dressing was very yummy and unique on the greens. The sauce tasted sweet, sourish and savory, a mixed of east and west. Overall, it was a nice, cosy and quiet cafe with a good view of the river.